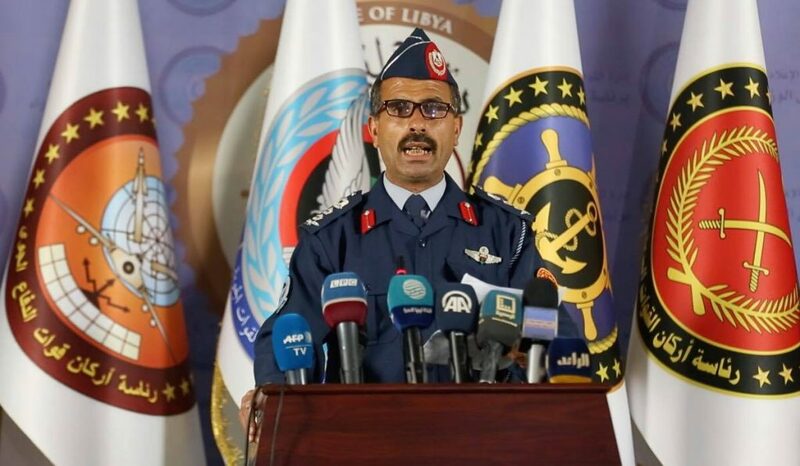 Serraj’s new official Libyan Army Spokesperson, Mohamed Gnunu, announced the start of operation ”Volcano of Rage” yesterday to counter the Hafter LNA offensive on Tripoli (Photo: PC/GNA). The Faiez Serraj-led Presidency Council and Government of National Accord launched its ‘‘Volcano of Rage’’ operation to counter the Khalifa Hafter-led Libyan National Army (LNA) offensive on Tripoli as Hafter seems to have lost the initial momentum. This official operation launched by Serraj seems to have replaced the ”Wadi Doum 2” operation launched by the coalition of Western Region Forces. The Volcano of Rage operation was announced yesterday in a televised statement read by Mohamed Gnunu, the Official Spokesperson for the Serraj-aligned Libyan Army. Gnunu was appointed on Saturday. Meanwhile, sporadic and scattered fighting continued over the weekend as the Hafter forces attempted to penetrate Tripoli claiming to have reached as far as Salah Al-Deen and Al-Khala in south Tripoli. However, the anti Hafter forces seem to have pushed them back to as far as Tripoli International Airport and beyond. Inconclusive cat and mouse fighting has continued to-and-fro from Tripoli airport to Azizia. The launch of operation Volcano of Rage came after Serraj had addressed the nation in a televised address Saturday night where he expressed surprise and betrayal by Hafter who he seemed to feel had genuinely agreed to a peaceful solution through the auspices of UNSMIL and through the forthcoming Ghadames National Conference to be held from 14-16 April. Serraj said Libyans were looking forward to the Ghadames meeting with optimism and that he had made numerous compromises for the sake of the nation during talks with Hafter in their meetings in Rajma (Hafter’s eastern Libya headquarters), Paris, Palermo and Abu Dhabi. Serraj now called for forces aligned to him to mobilize and defend Tripoli. He also vowed to take domestic and legal action against those who participate in the military action against Tripoli. Internationally, he called on supporters of Hafter to stop interfering in Libya’s affairs and called on the international community not to treat the aggressor (Hafter) on the same footing as the defenders of Tripoli. Meanwhile, Gnunu said that the GNA-aligned forces were mobilizing and that an operations room to coordinate actions had been set up. He claimed that Tripoli International Airport and Checkpoint 27 km had been recaptured with a large cache of armoured vehicles and equipment. He accused the LNA media machine of propaganda and vowed to defend the civilian state and not allow a military state. The fighting seemed to escalate as a no-fly-zone was announced by the Hafter LNA on Sunday who claimed that the Serraj-aligned forces conducted four airstrikes on Sunday at Azizia, Gharian and Al-Asabaa. LNA Spokesperson Ahmed Mesmari claimed there were no casualties. The LNA were in turn, reported to have carried out airstrikes against GNA forces at the Naqlia base on airport road. The fighting reached a degree at one stage that UNSMIL called for a two-hour humanitarian ceasefire to enable the evacuation of civilians on the southern outskirts of Tripoli after reports of random shelling and civilian casualties. Although much larger numbers have been quoted by numerous media sources, the Serraj Ministry of Health announced the final official death toll at 15 and 15 injured late last night, down from a higher earlier figure. These figures exclude those on the LNA side of operations. The Serraj Health Ministry also announced a state of emergency and full preparedness of hospitals and ambulances to receive the wounded. The IOM reported today that about 560 families or 2,800 individuals, have been displaced since the start of fighting last Wednesday. The fluid situation on the ground continues with claims and counter-claims of advances and repulses. What is clear is that the Hafter forces have lost momentum and failed to make deep incursions into Tripoli while the counter-forces have failed to push Hafter back to or beyond Gharian. There are still unconfirmed reports (as well as photographs) of Misratan forces heading to the fronts. This is important. If the main well-armed and battle-hardened Misratan militias do join the battle, it could change the whole scale and dynamics of the fighting and pose a huge threat to Hafter’s LNA. All this fighting and airstrikes came despite demands for restraint by the UN Security Council, the UK, France and the US. AFRICOM confirmed that it had evacuated security personnel from Tripoli. it said that ”a contingent of U.S. forces supporting AFRICOM temporarily relocated from Libya in response to security conditions. We will continue to monitor conditions on the ground and assess the feasibility for renewed U.S. military presence, as appropriate”. The Italian embassy said that it is to remain open. Yesterday, the United States said it was ‘‘is deeply concerned about fighting near Tripoli. We have made clear that we oppose the military offensive by Khalifa Haftar’s forces and urge the immediate halt to these military operations against the Libyan capital. Forces should return to status quo ante positions. All involved parties have a responsibility to urgently de-escalate the situation, as the UN Security Council and G7 ministers emphasized on April 5. This unilateral military campaign against Tripoli is endangering civilians and undermining prospects for a better future for all Libyans. There is no military solution to the Libya conflict. This is why the United States continues to press Libyan leaders, together with our international partners, to return to political negotiations mediated by UN Special Representative of the Secretary-General Ghassan Salame. A political solution is the only way to unify the country and provide a plan for security, stability, and prosperity for all Libyans’’.